Just finished pinning this quilt together. The quilt started with a “Jolly Bar” of “Fragile” fabrics by Zen Chic (Moda). Turns out this 5″ x 10″ size is practically useless. 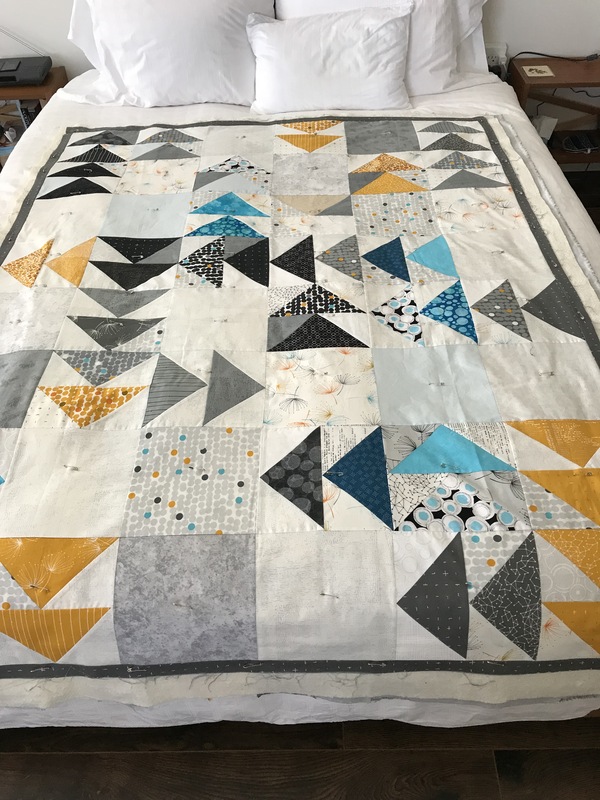 In order to construct flying geese I had to trim down the size, and trim away triangles from the corners – a wasteful way of doing this quilt block. However, I saved the triangles and created half-square triangles from the remains and used about half of them on the back. The original collection of fabrics had hints of turquoise in several of the colour ways but no predominantly turquoise fabrics. I decided to add several to brighten the overall appearance of the finished quilt. I had enough turquoise fabrics in my stash (dark and light) that I didn’t have to go looking for more. I also added in some light fabric since I didn’t have enough lights from the jolly bar to complete the flying geese blocks. I’m pleased with the modern layout and the overall feel of the top. The quilt is pinned ready for quilting. I’ve set up an 8″x8″ embroidery design which will fill each block and give me an overall quilting that should work reasonably well with the flying geese. Just trying to decide what colour thread to use for the machine quilting. 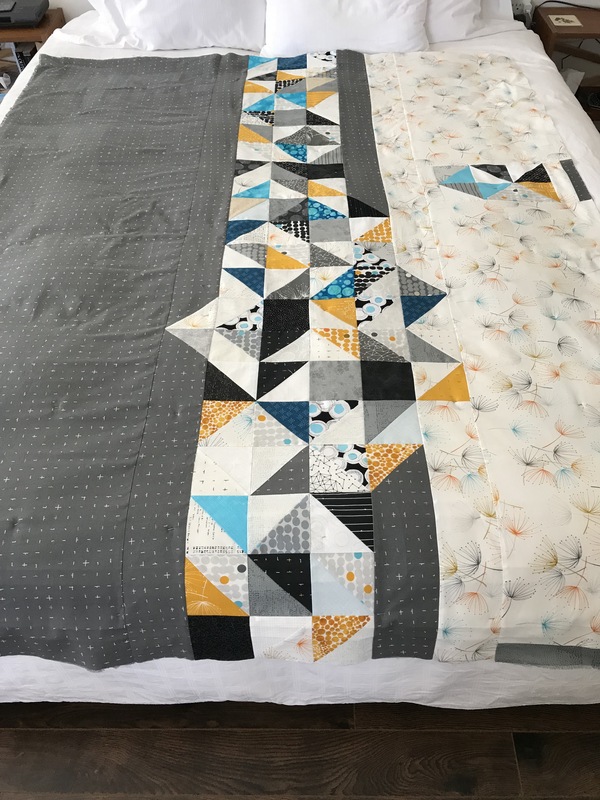 I plan on binding the quilt with the dark grey I’ve used on the back, with a small amount of contrast inserted in one side. I agree with you about those “Jolly Bars”–extremely useless size. I once ordered six of them, when they first came out, and ended up cutting just about all of them into simple baby quilts. You’ve done a great job, however, on corralling them into a fabulous quilt! I love the design and what you’ve done with simple geese. Thank goodness I only bought the one Jolly Bar. It would have been useful in a different way had I cut the pieces into 5” squares but I wanted flying geese. Thanks for commenting.